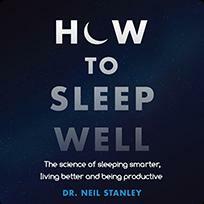 How to Sleep Well is a guidebook that can change your sleep and help you live your life more fully. How to Sleep Well is a guidebook that can change your sleep and help you live your life more fully. Whether you struggle to fall asleep, sleep too lightly, wake too often, or simply cannot wake up, this book can help you get on track to sleeping well and living better. It all starts with the science of sleep: how much you really need, what your body does during sleep, and the causes behind many common sleep problems. Next, you'll identify the things in your life that are disrupting your sleep cycle and learn how to mitigate the impact; whether it's the pressure of the workplace or that you simply cannot quiet your own mind, these expert tips and tricks will help you get the sleep you need. Finally, you'll learn how to support healthy sleep during the waking hours—what works with or against your sleep—and you'll learn when the problem might be best dealt with by your GP. Dr. Neil Stanley has been involved in sleep research for more than thirty-five years. He has worked alongside some of the best psychopharmacologists, ENT surgeons, psychologists, sociologists, and circadian biologists in the sleep field.